Print from original work of 19″x 24″. Made to order on archival paper. Earn 300 Points when you purchase this item! The original piece is ink and encaustic on bristol. The archival print is printed on archival paper and signed by me. Larger prints available on request. Only 20 prints in this edition are available. Each print measures 19″x24″ and includes a 2″ border. Image area is 15×20. 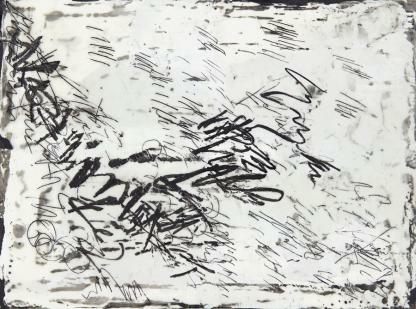 My first monotype was made on a piece of glass with acrylic paint. The texture and off-set alignment of shapes that resulted kept me busy for hours at a time. The monotypes that I now create involve a heated plate beeswax and pigment. I paint on the plate and use a variety of subtractive and additive techniques with encaustic to create images that I fancy as “Color Landscapes”. I experiment with temperature, tools, pigment and more to create one-of-a-kind works on paper. For Waxing Kara®, we are reproducing these original encaustic monotypes as acid free, archival, Giclee (laser) prints in editions of 20 per piece available in a range of sizes. Custom sizing is available.